They’re HERE! I am proud to introduce you to our new covers! Handmade here in Duluth MN and ready to cover your little one’s bum in stylish 100% cotton prints. I now have my covers after several years of wanting to make these, over a year of changing the pattern, testing the product, many missed deadlines, and almost 20 prototypes. They’re finished and they’re beautiful! Have you ever noticed that when you spend a lot of time making and creating something a little part of who you are is naturally imprinted in it? Whether it’s music, art, a business, crafting, building, cooking, or designing, if we do it right that “something” now speaks a little about us (if not a lot!). I didn’t know this would happen when I started making these, but it did. Consider the little part of me that you get with each cover a bonus! That’s the sweet extra you get when things are made locally while being thoughtfully and carefully created. My favorite thing about these covers (beside the fact that they are locally made) is the nice surprise I get when I go to change my daughter’s diaper and see the cute prints, it makes changing a diaper much more enjoyable! I am now a firm believer that the right fabric can brighten anyone’s day. We want to give a BIG thank you to several people who have made our covers possible! To Jordan Sundberg at Tin Cup Designs for designing our logo, product tags, and really helping with a lot of little things! She is awesome. To Sarah Kieffer at the Vanilla Bean Blog for the great photos and helping other people find out about us. To Stephan Gorny the tailor extraordinaire for the countless hours of sewing. I love that I get to work with local people and friends! To read more details about the specific design of our covers, simply click HERE to read our previous blog post about them. If you like what you see, head on over to the NEET Cloth Diapers Facebook page and there we will keep you up to date on new prints and products. You can visit the NEET page on our site to see prices, prints and to buy. 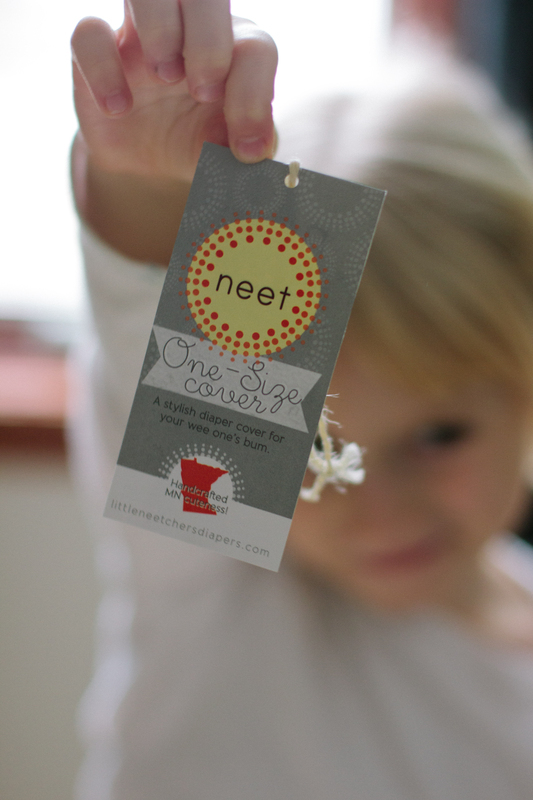 We are currently working on the NEET brand hanging wetbags as well as an awesome nighttime diaper! Live NEET.